These quilts are from our book, A Slice Of Christmas, which is available as an eBook. Click here to find it at pieceocake.com. The 1950s Santa Claus Quilt, below, is available as an individual epattern. Click here for more information. 1950s Santa Claus Quilt from the book A Slice Of Christmas by Becky Goldsmith & Linda Jenkins. Quilt by Linda Jenkins. The Christmas Trees from the book A Slice Of Christmas by Becky Goldsmith & Linda Jenkins. Quilt by Becky Goldsmith. Christmas Trees Table Runner from the book A Slice Of Christmas by Becky Goldsmith & Linda Jenkins. Quilt by Becky Goldsmith. A Sampling Of Santas from the book A Slice Of Christmas by Becky Goldsmith & Linda Jenkins. Quilt by Becky Goldsmith. Reindeer Playground from the book A Slice Of Christmas by Becky Goldsmith & Linda Jenkins. Quilt by Becky Goldsmith. Poinsettias from the book A Slice Of Christmas by Becky Goldsmith & Linda Jenkins. Quilt by Becky Goldsmith, quilted by Linda Jenkins. Rocket Santa Tree Skirt from the book A Slice Of Christmas by Becky Goldsmith & Linda Jenkins. Made by Becky Goldsmith. Poinsettia Tree Skirt from the book A Slice Of Christmas by Becky Goldsmith & Linda Jenkins. Made by Becky Goldsmith. A wonderful collection of quilts. A real inspiration. The most important thing a quilter can do is look after their health. We must, just to enable us to live long enough to complete even half of the projects we dream of. What a beautiful collection of quilts! Christmas quilts have always been my favorite. With that book in hand, one has no excuse for time, it being February…. Wow! Liking that Christmas tree table runner. I’ve always liked this book…..beautiful! My computer is performing magic tonight. One negative comment on your post and my epattern book just arrived. Thanks!!!!!!!! Why would I pay more. I have already paid and you accepted the money but I got nothing in reply. Could this site be a scam.. Byer beware. Thank you for parting with such a precious book, I hope I win it! Love all the different types of Christmas trees! A christmas Quilt is a fabulous gift for someone special. A great project to work on at a fall retreat. The poinsettia tree skirt would be my first project. I would love to win this book. Merry and bright would definitely describe the Christmas one would have after making “”a sampling of Santas” or the “1950’s Christmas Quilt” !! 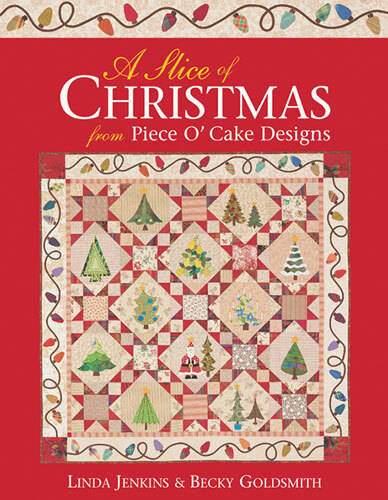 Great book of Christmas Quilts. If I start now, it might even be finished in time for Christmas! Love the patterns. Timeless Christmas designs! Thank you! I love applique, and the Santa quilts are adorable. Thanks for the draw. I love all the Piece O’ Cake designs and especially the Christmas ones. I have had this book on my wishlists for a while. It would be such a treat to win this one. Thanks for offering the opportunity. I would love to win “A Slice of Christmas” and make these Christmas projects. I especially love the table runner! Thank you Becky for the most wonderfully interesting and beneficial workshop I have ever been a part of last weekend in Huntsville, AL. My friends and I are still talking about it! I am interested in winning the book give-away. May the random number drawn be mine! Ps. My appliqué stitch has improved tremendously. 😀 Pamela Erickson. Pjhquilter@yahoo.com.